These are the steps to root Samsung Galaxy A5 SM-A500G smartphones using the CF-Auto-Root tool by Chainfire — the same guy who makes the Triangle Away app — and the Odin flashing tool by Samsung. Users should follow this guide with the SM-A500G variant of the Samsung Galaxy A5 smartphone and not any of the other model numbers in the Samsung Galaxy A5 range. You can found out what your model number is by tapping on the Menu > Settings > About Device > Model Number. The CF-Auto-Root tool in the post is based on LRX22G.A500GXXU1BOJ2 firmware and the Android 5.0.2 Lollipop software update. It doesn’t mean you should be running that same firmware but rather it is to be used as an indicator. Older versions of images do not boot on some Samsung smartphones. Download the Samsung USB Drivers  for the Sammy A5 smartphone and install them on the Windows computer before you get stuck into the guide. Unlock the Developer Options menu on your Galaxy A5 smartphone by tapping on the Menu > Settings > About Device > Build Number and keep tapping until it says you are using the device as a developer. Enable the USB Debugging Mode from the Developer Options menu that is now available from your Settings by tapping on the Menu > Settings > Developer Options > USB Debugging Mode. Download the CF-Auto-Root package for the Galaxy A5 S500G device from this link . Download the Odin v3.09 from this link . Right-click the mouse over the files after you put them on the desktop and choose the “extract here” option from the menu. Double-click over the Odin executable file and wait for the Odin app to open up on your computer. 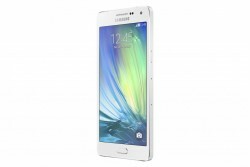 Turn off your Samsung Galaxy A5 smartphone and reboot it in download mode . Connect the Samsung Galaxy A5 to the computer with the USB cable that comes with your device out of the box. Click the PDA or AP button that is available from the Odin user-interface on your computer. Browse the desktop location for the tar.md5 file you extracted in the beginning. Leave all default settings the same way they are already. Click the Start button and the Odin flash tool will now flash that CF-Root package on your Samsung Galaxy A5 and root the device. Look at your Samsung Galaxy A5’s display for when it says it is about to reboot and it will reboot itself in recovery mode. You must boot the Samsung Galaxy A5 by holding the Volume Up + Home + Power buttons and manually get the device in recovery mode if it does not happen automatically. It does happen automatically for most devices.